May is melanoma and skin cancer detection and prevention month, so we’re shining a light on practical tips to help avoid and treat skin cancers. 80 percent of skin cancer deaths result from melanoma, and the sunshine state of Florida has the second highest melanoma incidence in the nation. • Seek shade – especially between 10 a.m. and 2 p.m. As a rule of thumb, if your shadow is shorter than you, seek shade. • Wear protective clothing – lightweight long-sleeved shirts, pants, a wide-brimmed hat and sunglasses are recommended. 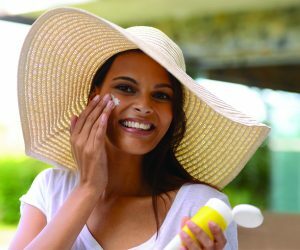 • Use and re-apply sunscreen – generously apply broad-spectrum, water-resistant sunscreen with an SPF of 30 or higher to dry skin 15 minutes before going outdoors, even on cloudy days. Be sure to cover all exposed skin. Re-apply at least every two hours (even more frequently if fair skinned), and after swimming or sweating, regardless of SPF rating sunscreen used. • Beware of sun reflection – use extra caution near water, snow and sand. These elements reflect damaging sun rays and increase sunburn. • Avoid tanning beds – consider a self-tanning product instead. As most self-tanners don’t protect from harmful rays, be sure to use sunscreen too. certified dermatologist early if you detect suspicious spots, especially any skin spots that change color, size, itch or bleed. Seeing a specialist as soon as possible is important, as cancer is most treatable when detected early. For patients working with doctors to treat a skin cancer diagnosis, one of Cypress Pharmacy’s most popular treatment products, 5FU (5-Fluorouracil,) can help. 5FU is a topical, chemotherapy drug used to treat skin cancer and pre-cancerous areas. Originally 5FU was compounded to lower the strength (from 5% to either 1% or 2%), to minimize side effects while maintaining efficacy. Patients usually find that our compounded 5FU medications is significantly cheaper than the commercially available versions. 5FU is used to treat actinic and solar keratosis, which are skin lesions caused by years of excessive sun exposure. It is also used to treat Superficial Basal Cell Carcinoma. 5FU works by killing abnormally rapid-growing skin cells. It is typically applied to affected lesions twice daily until lesions go away or peel off. Lesions can take two to twelve weeks to completely heal. As Fluorouracil makes skin more sensitive to sunlight, wearing protective clothing and sunscreen while using this treatment is recommended. If you or a loved one are working with a doctor to treat a skin cancer or pre-cancerous area, Cypress Pharmacy is here to help! We have been providing pharmaceutical and healthcare services in Fort Myers for more than 40 years. The entire staff, including pharmacists T.J. DePaola and Justin Ceravolo, are dedicated to providing the best possible service to every customer. For more information, call 239-481-7322 or visit www.cypresspharmacy.com.